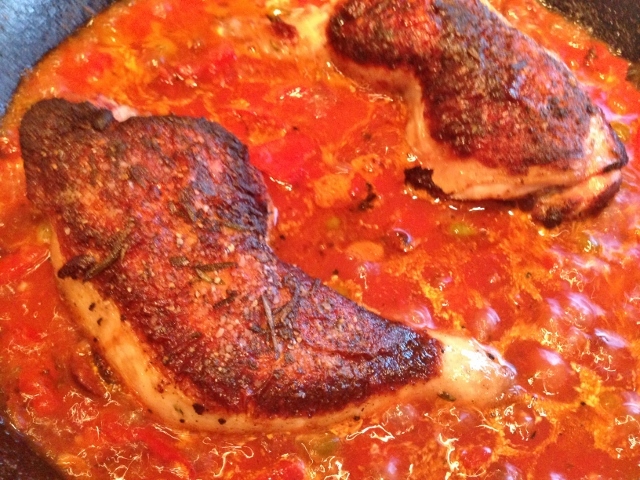 Chicken Puttanesca - Recipe! - Live. Love. Laugh. Food. Chicken is a family staple and with the right sauce, it can be more than just basic dinner. 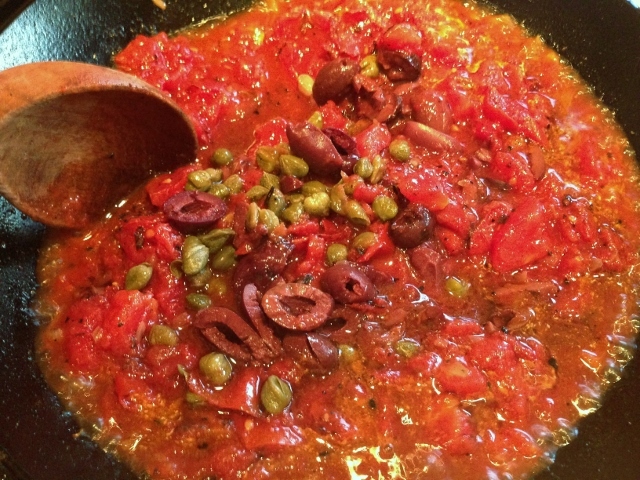 Puttanesca is an Italian style sauce with olives, capers, tomatoes and anchovies. Some people turn their noses up when it comes to anchovies, but they actually are mild in flavor and melt when heated with olive oil. 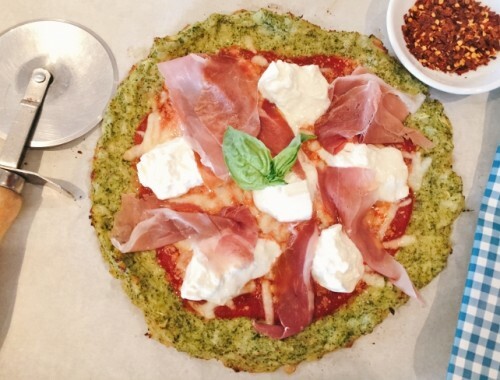 They give the sauce an extra something special – sort of Umami taste with a hint of the sea. 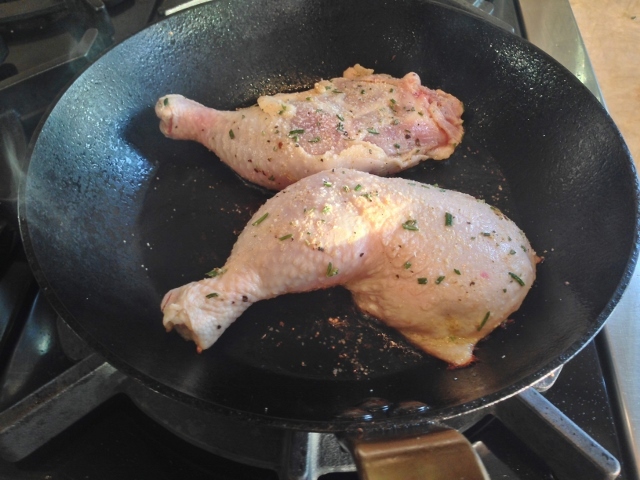 Chicken Puttanesca is made with whole chicken legs which are actually a thigh and leg attached, but you can use just thighs or even breasts if you don’t prefer dark meat. 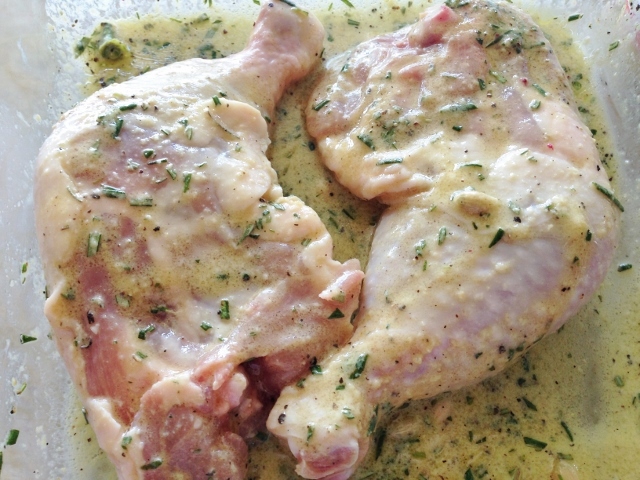 I marinate the chicken legs for at least 3 hours ahead of time to give the chicken added flavor. 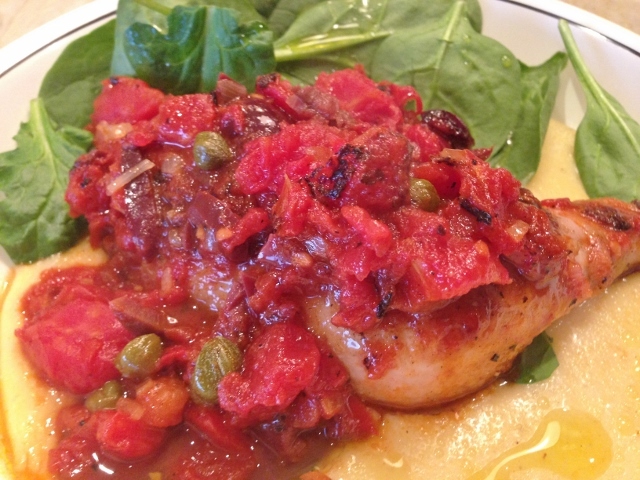 The puttanesca sauce is simple to put together and added to roasted chicken legs, wow…delicious! 1. Preheat the oven to 425 degrees. Wash and pat dry with paper towels the chicken legs. 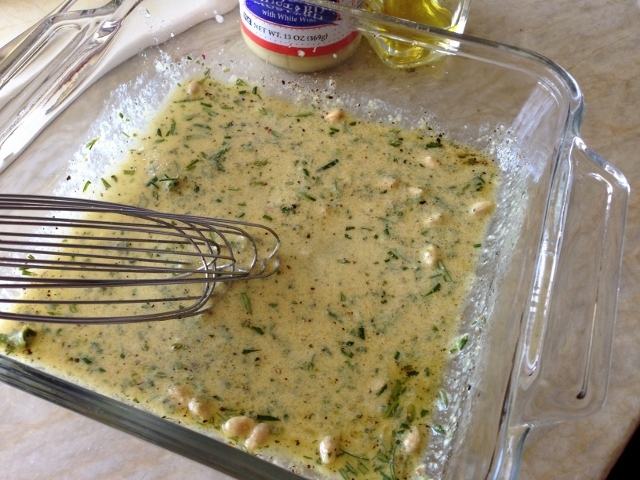 In a small casserole dish, add the Dijon mustard, rosemary, lemon juice and olive oil. 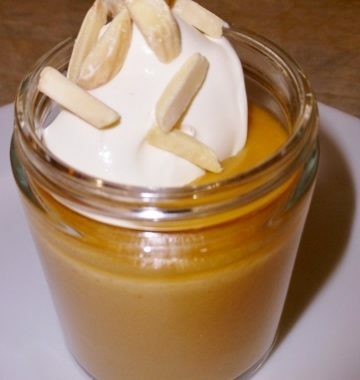 Whisk until the ingredients are combined and place your chicken legs inside to coat. 2. 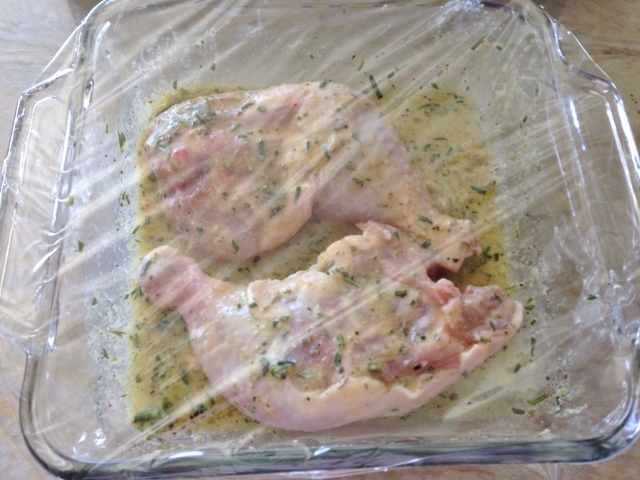 Cover the chicken with plastic wrap and refrigerate at least 3 hours or up to 8 hours. 3. Remove the chicken from the marinade and pat dry with paper towels. 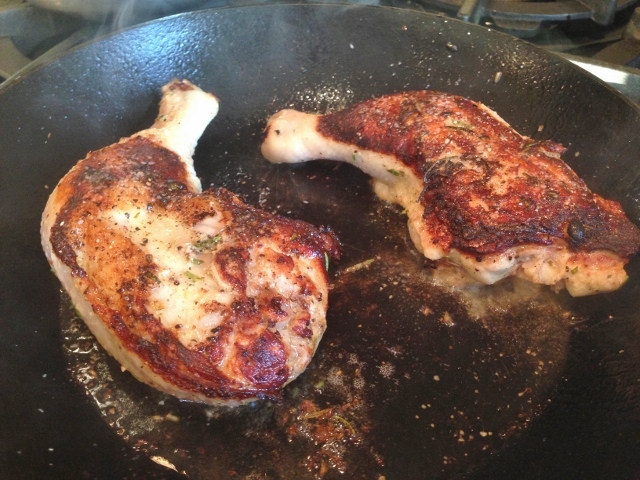 Add 2 tablespoons of olive oil to a oven proof skillet and place on medium-high heat. When the oil begins to smoke, add the chicken legs. 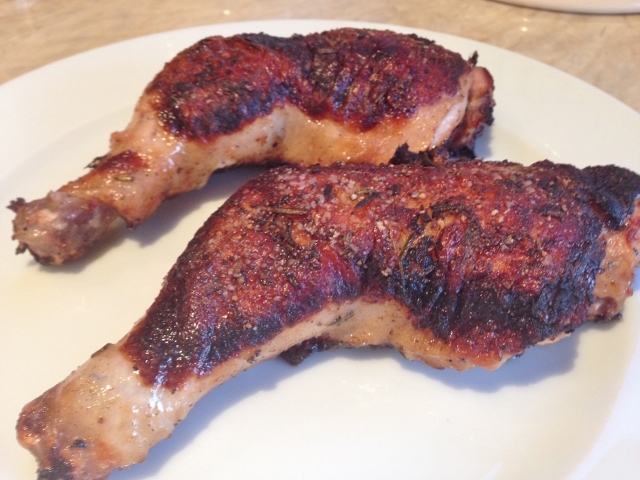 Cook the chicken legs for 3 minutes and then flip over to brown the other side. 4. 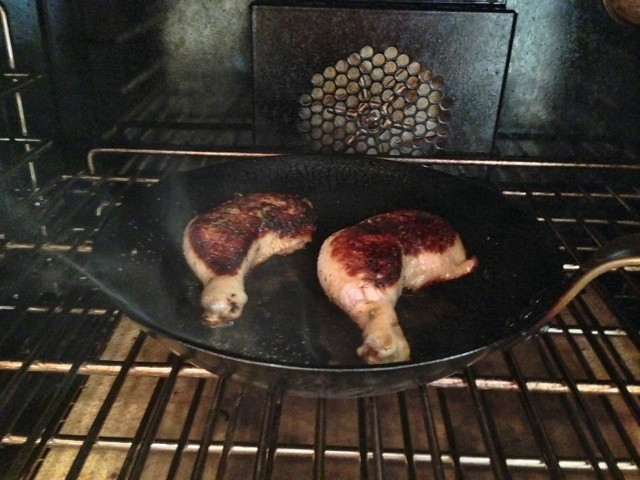 Cook another 3 minutes and then place the chicken in the oven to roast for 30 minutes. 5. 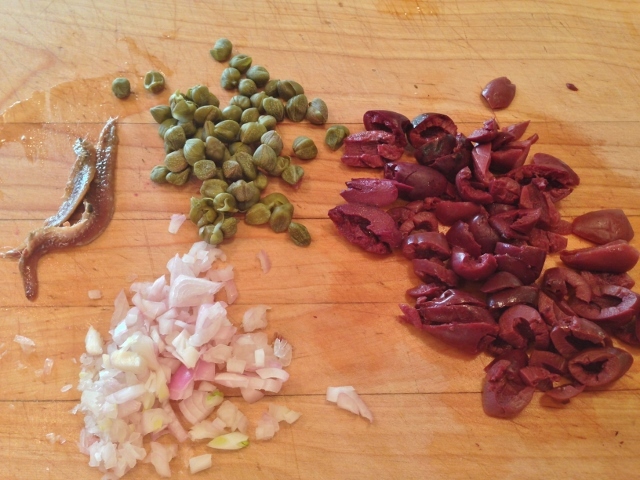 While the chicken is cooking, roughly chop the kalamata olives, dice the shallot and rinse the capers and anchovies. 6. 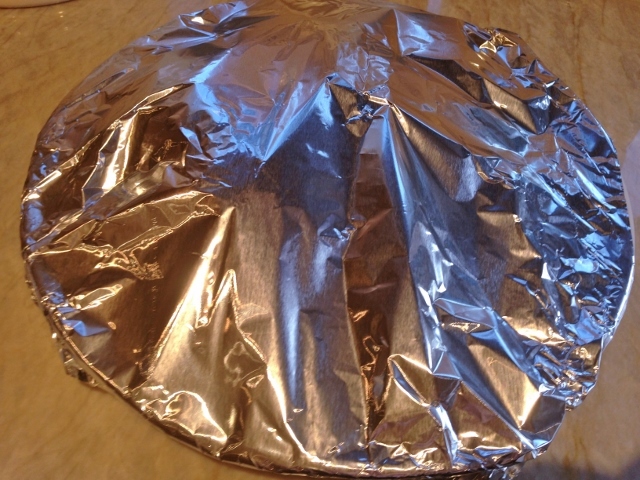 Remove the chicken from the oven and place the roasted legs on a plate and cover with foil while you make the puttanesca sauce. 7. 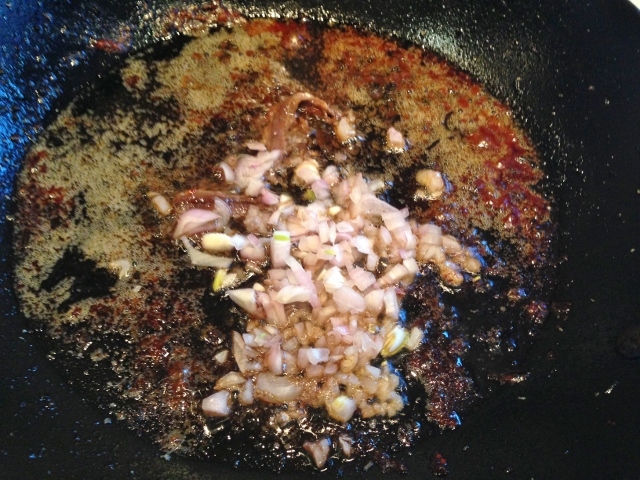 In the same skillet as the chicken was cooked with all the chicken juices, add the anchovies and shallots. Turn the heat on medium and saute for 2 minutes or until the anchovies melt. 8. 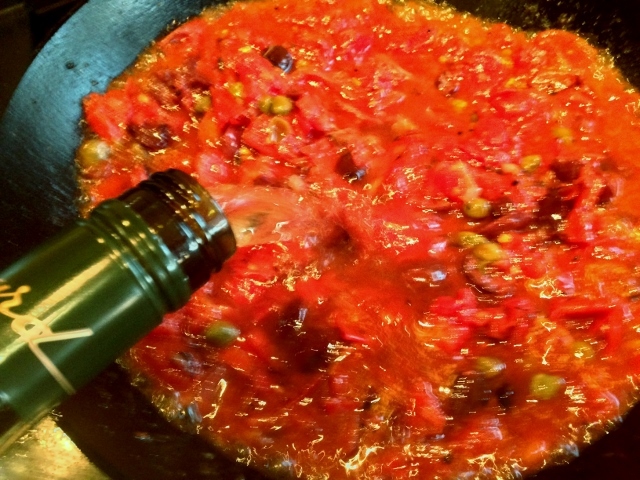 Add the can of tomatoes, olives and the capers. 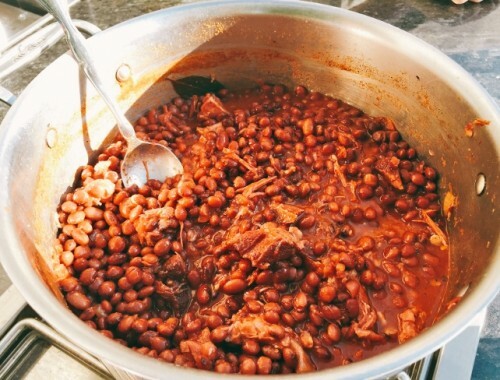 Continue to cook the sauce for 3 minutes. 9. 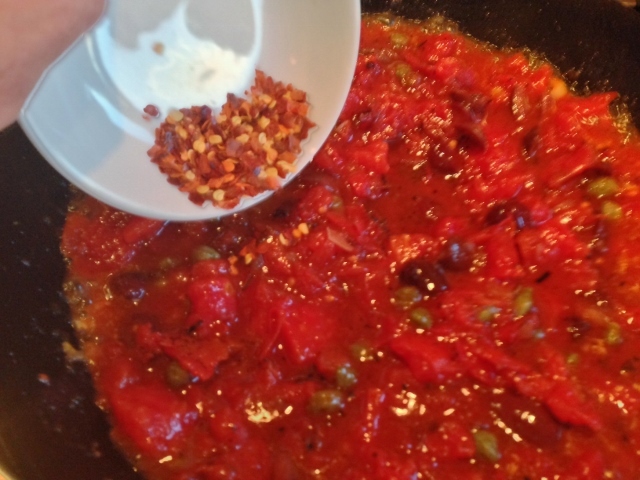 Add the red pepper flakes to the sauce and continue to cook for 2 more minutes. 10. Add the chicken broth to the sauce and cook until it is slightly reduced, about 4 minutes. 11. Add the chicken and the juices back into the puttanesca sauce and cook for 5 additional minutes. 12. 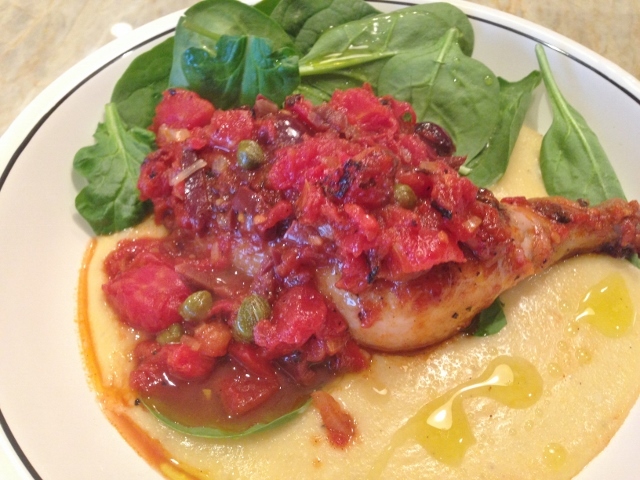 Serve your Chicken Puttanesca with fresh greens and/or polenta, if not on Whole30 or Paleo. Enjoy!